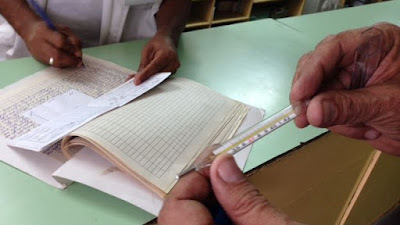 El Blog de Medicina Cubana: Thermometers returned to some pharmacies in Havana, Cuba. Thermometers returned to some pharmacies in Havana, Cuba. Thermometers again available in Cuba, but only on the ration book. After disappearing for months, this January thermometers have returned to some pharmacies in Havana, although they can only be purchased through the ration book. In 2015 about 60 medications - included in the “basic health core”- where unavailable in Cuban hospitals and pharmacies, mainly those used in the treatment of cancer. Also missing were over-the-counter products such as adhesive tape, elastic bandages and Band-Aids. Publicado por EG en 1/20/2016 03:00:00 p. m.